DALLAS, TX (KTRK) -- A Texas teenager who used an "affluenza" defense in a fatal drunken-driving wreck will appear Wednesday in adult court for the first time. Ethan Couch, who turned 19 on Monday, will appear before a Fort Worth judge who could order more jail time as part of the terms of Couch's adult probation. Prosecutors and court officials declined to confirm the nature of the hearing, saying the judge has issued a gag order. Couch got 10 years' probation in juvenile court for a June 2013 wreck that left four dead and two severely injured. He landed in jail after he fled with his mother, Tonya, to Mexico when a video surfaced online showing Couch apparently at a party where alcohol was being served. Drinking alcohol is a violation of Couch's probation. The two were apprehended in Mexico in December and brought back to Texas in January. Couch is scheduled to appear Wednesday before State District Judge Wayne Salvant in Fort Worth. He was transferred out of the juvenile system and into an adult jail in February. Salvant could now order him to spend up to 120 days in jail then finish the rest of his 10-year probation. If Couch were to violate his probation during that time, he could get up to 10 years in prison for each of the four people killed in the crash. The jail time would not be issued for any violation of his juvenile probation, including fleeing to Mexico, but would be set as a condition of his adult probation. It's not yet clear whether Salvant will make that decision Wednesday. An official in his chambers declined to comment, as did Tarrant County prosecutors. Couch lost control as he drove his family's pickup truck after he and his friends had played beer pong and drank beer that some of them had stolen from a Wal-Mart. He veered into a crowd of people helping the driver of a disabled vehicle on the side of the road. Authorities later estimated that he was going 70 mph in a 40 mph zone. State District Judge Jean Boyd gave Couch 10 years of probation, a sentence that outraged victims' relatives and prosecutors who had wanted prison time. When the December video of Couch at a party surfaced online, authorities say Couch's mother, Tonya, arranged for the two of them to flee to Mexico. They were found a few weeks later in the Mexican resort city of Puerto Vallarta. 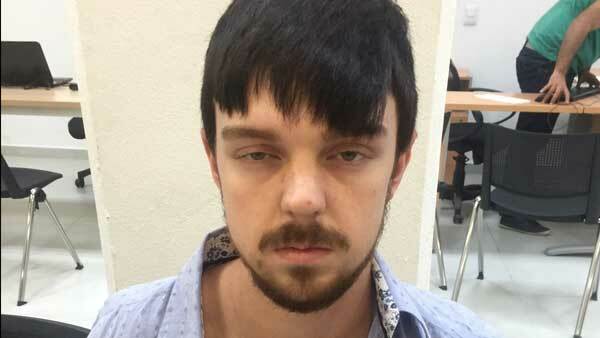 Ethan Couch appeared to have grown a beard and dyed his hair black. Tonya Couch is charged with hindering the apprehension of a felon, with the possibility of two to 10 years in prison if convicted. She is currently under house arrest. Salvant is also the judge in her case.